In the initial stages of gathering research, the internet can be a useful tool if used wisely. As you are just beginning to gather information, you want to cast a wide net to understand all the angles of your topic. One great online site to begin is Google Scholar. If you search “Lower Drinking Age,” you’ll see a sidebar on the left that offers you a way to narrow the results by type, year, and relevance. On the right is a “My Citations,” link where you can track a researcher’s work (you have to have a Google account for this). The advantage of this tool is if you find a particular researcher who is publishing work in your topic of interest, you can find other relevant publications by the same author. Once you find some intriguing articles, you can click on the link to read the abstract (description of the article). If you scan over to the right of the link, you may see links to the printed version in a PDF file with the full text. At the bottom of the annotated link, you’ll see a horizontal list of further help, including “Cited,” which shows many times the article has been cited; html, if this type of version is offered, other related articles (which is a good info to have for further research; other versions of the article (which may include more current research), and other types of information related to the article. If you are on a campus computer, you may also see a link under the link that says, “find at MCC,” (or your local college or university). This means your campus will have that source in one of its libraries or have access to it. Take some time in this stage to tweak your search terms and scan the research to find the perfect support for your paper. Take careful notes of the articles and authors you might to use, or if you are able, print out the full link so you’ll have it when you go back to read the full text later. Slowing down and taking these steps will save you time later. 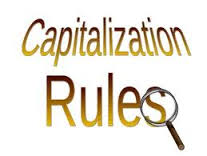 Capitalization can be confounding to beginning writers. Some words are easy to remember, like proper names and places. But what about ages and time periods? Regions and geographical areas? And diseases – are all diseases capitalized, or just some, and what’s the difference? The answer to some of these questions is it depends on the documentation style you are using. For our purposes here, we’ll refer to MLA style unless otherwise noted. When a proper name is preceded with a title, like judge or professor, the titles will be capitalized. I took British Literature from Professor Kennedy. We were married at the courthouse by Judge Baker. Boys Town was started by Father Flanagan. However, do not capitalize titles when they stand alone. When I grow up, I hope to be a professor. My uncle is a judge. When referencing family names, only capitalize the relationship when they are part of the person’s title. Her Aunt Cindy is a lawyer in New York. Her aunt is an expert quilter. My mother has a huge record collection. If the time period is referred to by a specific name, it is capitalized. When used as a descriptive, no capitalization is necessary. North, South, East, and West are capitalized when indicating geographical regions. Regions such as the Mid Atlantic, Silicon Valley, and Midwest are capitalized. Usually if “the” can go in front of the word, it is capitalized. North, south, northwest, etc. are not capitalized when indicating a direction or used as an adjective. She drove south through Atlanta. Diseases named after regions and people are capitalized. Ebola and West Nile are capitalized, as both are named from the regions where they originated (Ebola is a river in Zaire, and West Nile is a region in Uganda). Alzheimer’s disease, Asperger’s syndrome, and Down’s syndrome are named after the doctors who discovered the diseases. However, there are differences between style guides as to whether they are possessive. If in doubt, follow the style used in your field of study or your textbook. Most disease names are not capitalized, as the names are derived from some hallmark of the condition, according to Grammar Girl. Diabetes, autism, lupus, and rheumatoid arthritis would not be capitalized. It’s most important to stay consistent, regardless of the style you use. For more help with capitalization questions, visit The Grammar Book or Grammar Girl.